Peter Joseph von Lindpaintner is one of many composers that have fallen into oblivion. 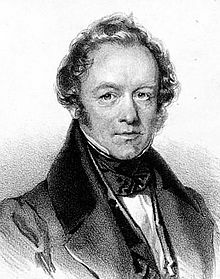 Born in Koblenz 8th December 1791 he studied under Peter von Winter. As music director he worked first in Munich and then as Hofkapellmeister in Stuttgart. In the latter position Lindpaintner was appreciated by Schumann and Berlioz, and Mendelssohn wrote in a letter: “Der Lindpaintner ist, glaub’ ich, jetzt der beste Orchesterdirigent in Deutschland; es ist, als wenn er mit seinem Tactstöckchen die ganze Musik spielte” (Lindpaintner is now, I believe, the best director in Germany; it’s as if, with his batons, it’s him who plays the entire music). Almost forgotten nowadays, in his time he was held in high regard. The few things one can hear from Lindpaintner on youtube show a fertile talent, without the originality of other composers. The pieces are not memorable, but worth hearing. 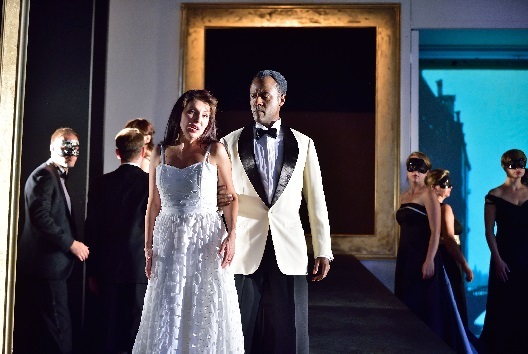 Regarding the opera presented in Bad Wildbad, Lindpaintner chose a historic/romantic/exotic subjects, as they were very fashionable at the time and the libretto of Die sizilianische Vesper by Heribert Rau makes no exception. It tells the story of the rebellion that broke out in Sicily during Easter of 1282 against the rule of the French king Charles I. Lindpaintner’s Die sizilianische Vesper (in Wildbad played as Il vespro siciliano, a version prepared by the composer) follows the trend of upcoming German grand opéra in the likes of Wagner’s Rienzi or some of the Marschner operas, while the musical model for the opera was clearly the grand opéra of Guillaume Tell, La muette de Portici, but mostly Meyerbeer. Hearing a new piece of music for the first time is always a treat, just pity that two numbers were not played (choir and ballet in act III and Eleonora’s aria in act IV). Musically the opera in its entirety did not satisfy. It’s never very clear where the plot is going. Only the 4th act, which begins with a jailer being fooled and ends with the rebellion of the Sicilians, is very convincing. Although there are many lovely melodies, the musical inventions are without the dramatic depth one is accustomed to in Meyerbeer. Also the closing of the acts seem to come out of nowhere without a proper build-up. Nonetheless it remains a highly enjoyable evening just for the sake of hearing a musical novelty. The main Rossini opera given in Bad Widlbad was Bianca e Falliero, which was composed by Rossini in a hectic period for the Scala of Milan. Criticised by the contemporary press, it run for 39 evenings, a considerable number even for the time. About Bianca e Falliero Stendhal, in his Vie de Rossini, writes: Quant a la partition de Rossini, tout était reminiscence. If anything, the opposite is true. Rossini only uses the final rondo from the recently composed Donna del lago, but, except for a few hints, the music is original from the beginning to the end. In fact, Rossini will use some of the music for Moïse, Maometto II and Siège de Corinthe. The wonderful Act II quartet was inserted in a 1824 Parisian staging of La donna del lago. Except for the already mentioned Act II quartet, I personally think the Act I quartet Cielo il mio labbro ispira is equally beautiful as are the two duets of soprano and contralto (duets between soprano and contralto are always a treat in every Rossini opera). L’inganno felice is a farsa, a short comic opera, the third staged opera composed for Venice when Rossini was not even 20 years old. L’inganno felice was quite successful in Italy and beyond. The Bad Wildbad staging is again simple and altogether satisfactory. Music-wise very good with a cast that was pleasing throughout the opera. A little unknown gem was proposed this year: Le cinesi, a one act opera composed by Manuel Garcia, a world class tenor in Rossini’s time (the first Almaviva in the Roman Il barbiere di Siviglia), composer, renowned teacher and partially famous for being the father of two famous primadonnas of the 19th century: Maria Malibran and Pauline Viardot. The plot of Le cinesi was used by several composers including Gluck. The voices were not perfect but some of them were very promising. The young singers all sang passionately and charmed with their enthusiasm. This 1hour and 15 minute long opera was a sheer delight to hear and watch. The singers reunited this year in Bad Wildbad were mostly good. Bianca’s role was sung by Cinzia Forte, a soprano I heard several times lately, not from her best side, though, I must say. In Wildbad the approach was very cautious but with the help of the director Forte was utterly convincing in a very difficult role. Kenneth Tarver sang well but from the moment the singing line rose to higher notes, all coloratura was flattened and the voice sounded forced. I am unsure on what to say about the Falliero of Victoria Yarovaya. She certainly was appreciated by the public who loved the rapid coloratura, the house came down after each of her solo aria’s. Her voice is a typical Slavic voice with a slight vibrato, not a warm voice and a times a bit dry; Her coloratura was quick but not always di forza and a bit uneven. I’d certainly like to hear her again. 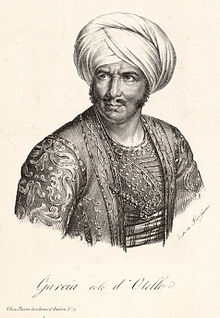 Baurzhan Anderzhov, who was the 4th of the quartet and who sang also the villain in L’inganno felice, sang with a steady and beautiful voice and credible acting. The setting in Bianca e Falliero by Primo Antonio Petris was minimal but effective. A few huge golden frames gave partition to the stage and the pictures of Venice in the background immediately defined the location. Artavazd Sargsyan always convinced me in previous years but Bertrando’s entrance aria in L’inganno felice was slightly nasal and quite unclean in the coloratura. Something I hope is an exception in this young singer’s career. 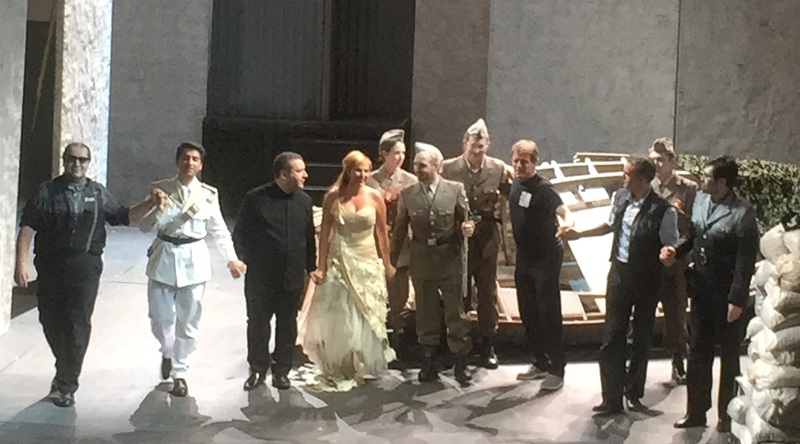 Tiziano Bracci and Lorenzo Regazzo were superb in singing and acting. In fact what made the opera a delight was the comic verve of Lorenzo Regazzo. The “teneste la promessa”-joke was hilarious for who got it. A real actor who brought this lovely farsa to life. I personally prefer Della Benetta much more as Eleonora in Il vespro siciliano, where she is able to display her dramatic interpretation, than as Isabella, where she sounded a bit rigid. She has a strong and beautiful voice and I would like to hear her again, maybe in an unknown, dramatic Mercadanta, Pacini, Carafa, Coccia, or Manfroce. Danilo Formaggia as Conte di Fondi has a worn out voice, and it’s quite painful to hear him especially in the first act where his role is quite present. Cesar Arrieta is a charming Siveno and a fresh-voiced Drouet. Matija Meic sings well but I would have wished a king with more authority. Authority which Russo doesn’t lack, who also sings well. I much enjoyed Ana Victoria Pitts’ singing and acting as Tangìa. Antonino Fogliani directs lightly with verve and vivacity (at times a tad too quick). Federico Longo directs well and brings the forgotten Vespro to life with a big sense of musicality. The Virtuosi Brunensis orchestra didn’t play well: many mistakes, smudged notes, wrong entries ecc. The Bach Choir Poznan sang adequately though with a miserable pronunciation. To close with a minor note: This year in Bad Wildbad my hotel was close to the new parking lot. A slab of concrete close to the festival area. And I started to realized how much of it was present in Bad Wildbad: The concrete roofing of the shops just below the café Melange, the building just next to the Palais thermal, several houses in the shopping street, many of the small bridges that cross the Enz in the village centre just to name a few, which are just too many for an 11000 souls’ village.